Brief reviews from my second trip through from Glasgow to the Edinburgh Fringe this year. I wanted to see some comedians this time, but as they don't wake up until the afternoon there was time to squeeze in some other stuff first. We started off by going to see the exhibition on Mary, Queen of Scots at the National Museum of Scotland. It is an absolutely fascinating collection of stuff and the story of her life reads like a ludicrous Hollywood plot. I know the history of a nation is not the same as the history of its kings and queens but it is a story worth hearing. I've been inspired to try to find out more as it is a period of European history that ties me in knots. 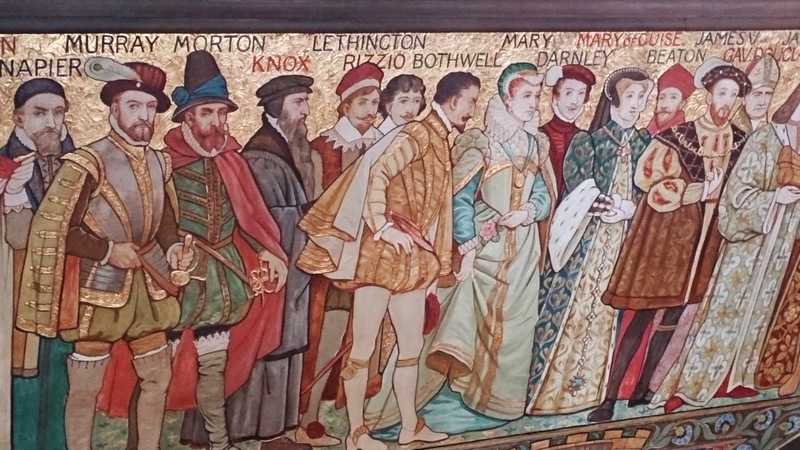 John Knox seems to have been a constant thorn in her side. As well as her Catholicism he wasn't big on female monarchs either apparently. A proper ray of sunshine he seems to have been. Whilst promoting his film "Exit Through The Gift Shop" in LA in 2011, graffiti artist Banksy got chatting to a homeless man who had been living in a disused water tank. 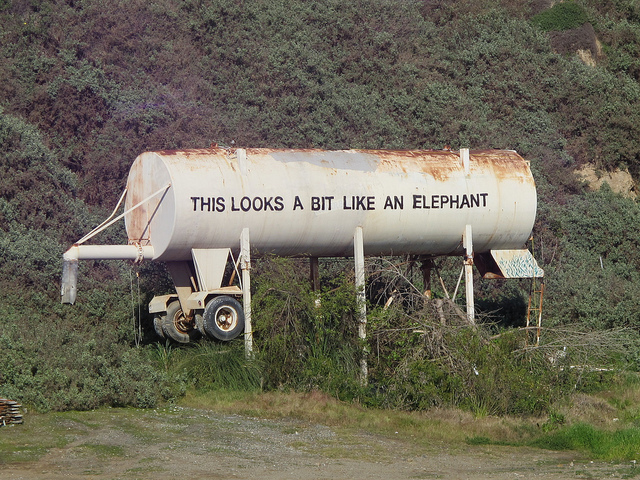 With his permission wrote "This looks a bit like an elephant" on the side of it. Cue rapacious grasping for ownership of a Banksy work (which the artist refused to authenticate) and Tachowa Covington was made homeless. Here Gary Beadle off of Eastenders plays the man who had made his home in the tank for the 7 years before meeting Banksy (as Titus Coventry here). The story asked lots of questions about what makes art 'art' without really giving any answers. Gary Beadle's was a gripping one-man turn, as he debated issues with the toy rat he had for company (a recurring Banksy motif) and Bristolian music from Portishead and Massive Attack occasionally broke in. However in a surreal twist at the end we were introduced to the man himself, Tachowa Covington. He is over from LA and saw the show for the first time himself today. A lovely twist that slaps you in the face with the fact that this is a real life being recounted. 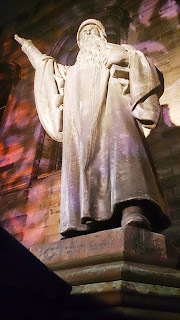 The man himself had dressed up in a purple kilt and a fedora to mark the occasion. You can only hope that he manages to get some personal benefit from the play, to help him get what he wants in life. Shame we never got to hear his thoughts on it and I hope some journalists are all over him tonight to hear his tale. After that we had time to dash about some of the exhibitions which are part of the Edinburgh Art Festival. 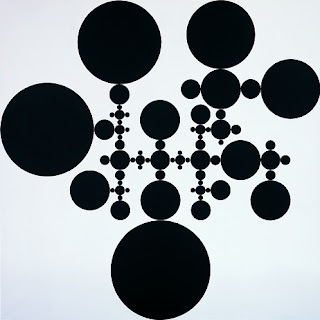 One of the best is in the ever-reliable Fruitmarket Gallery where there is an exhibition of paintings, photography and sculpture by Gabriel Orozco, Thinking In Circles, in which the geometric motif is played out in a variety of ways. The centrepiece is a painting called The Eye of Go. This I liked as I have read a couple of Japanese novels and a manga which feature the game of Go, played with black and white discs. GO is also the artist's initials and a verb which opens up a variety of meanings. (D'you see what he's did there?). If you look at them long enough you start to see Mickey Mouse too. There has been a lot of love for the Peter Doig exhibition on at the Scottish National Gallery, No Foreign Lands. The Scottish-born artist, little known in his own country, has lived extensively in Trinidad and this exhibition features works painted over the past 13 years since he returned there. The scale and vibrancy of the paintings is more remarkable in the flesh than in any of the reproductions of his paintings which I had seen in the papers before I went along to see it. Often there is a sun-bleached, dreamy quality to them. I liked the colour and composition whilst my wife was unimpressed with his draughtsmanship. Then again I quite like the primitive works of French painter 'Douanier' Rousseau whilst she hates them. Keeping the Mary Queen of Scots theme going we had time to have a quick pint in the Queens Arms before wandering on via the Open Eye Gallery who have a interesting show of Alberto Morrocco's early works and sketches on show. I'm personally not a big fan of a lot of his later work but his skill shone through in these. I particularly liked the pen and ink sketch of a drunk man falling asleep on the train. Around the corner in the National Portrait Gallery on Queen Street, there is a temporary exhibition of new work by someone else who can definitely draw. Ken Currie's work is painterly, skillful and full of atmosphere. To be honest seeing these made me re-appraise my opinion of Peter Doig's stuff we'd seen earlier as these paintings had so much more to them on many levels. Running upstairs past the mural featuring Mary, Queen of Scots (once you start noticing her she's everywhere) we went to see the Man Ray photographs, a fascinating collection of people captured by his camera. The Fleece to Fibre exhibition in Dovecote Galleries is worth looking in at, if for nothing more than the spectacular photograph portraits of the sheep. I also liked Rachel MacLean's slightly mental exhibition on at Edinburgh Printmakers, I Heart Scotland. A bizarre spectacle, as if the souvenirs from a tacky tourist shop have come alive in her photomontages but done with a great sense of humour. Her Lion and the Unicorn film maybe shows where the independence debate should be going instead of the current petty sniping we have to endure. So as the galleries closed their doors it was obvious that the comedians were waking up. We had passed Jerry Sadowitz, Tim Vine and John Lloyd in the streets but we weren't here for them. Alexei Sayle is a comedy legend as far as I'm concerned. He first entered my consciousness as the shouty, angry landlord and various random, mental members of the Balowskis family in the Young Ones TV show, before going on to have his own TV series of monologues and rants. One time member of the Communist Party, actor in Indiana Jones and the Last Crusade and if you haven't read any of his novels then you are missing a treat. I shouldn't forget "Hello John, Got a New Motor" either as it appears to be one thing he reports that people still expect him to do. As the original compere of the London Comedy Store he was present at the birth of "alternative comedy" but hasn't done stand up himself for about 16 years. As you'd hope, he is a bit vitriolic about the current banal level of observational comedy and also pillories the current upper class stranglehold of media, the arts and government. Apart from the fact that he had something to say, he was also laugh out loud funny whilst saying it. 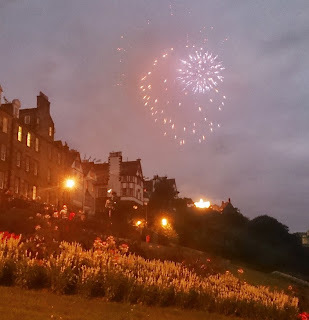 We were given a free firework display from the Tattoo whilst we waited to get into the Assembly Halls on the Mound, where we were greeted by a statue of John Knox as we made our way in, snarling over the temporary bar set up here. Is it the piece which he wrote called "The First Blast of the Trumpet Against the Monstrous Regiment of Women" that they commemorate here with this statue or some other achievement of his? Marcus Brigstocke is the omnipresent voice of liberal ire on Radio 4 comedy programming at present. 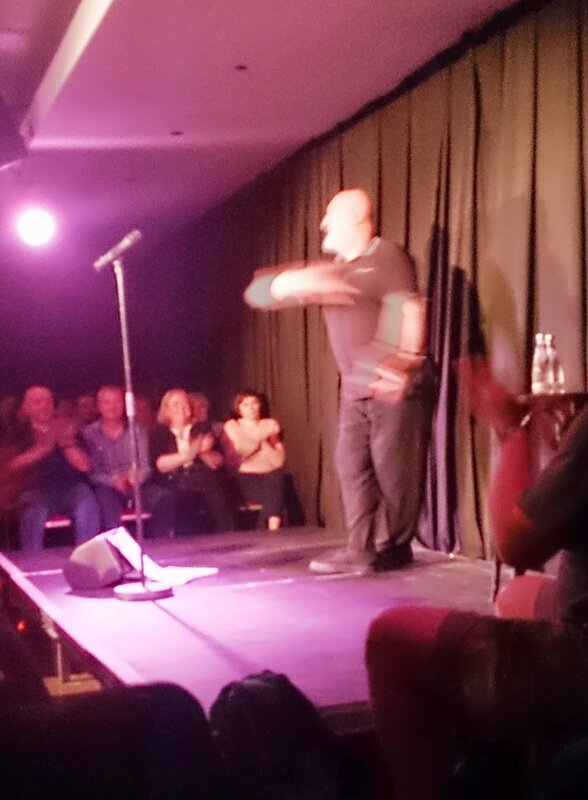 He seems to have had a couple of shows on in Edinburgh this year, and 2 days into a three week run here he tells us that he tore his achilles whilst jiggling about on stage. He has soldiered on and starts by saying he'd decided not to do any political stuff this year. So instead we got rather banal observational stuff. His tales of his boarding school and the scary working class people he met on the oil rigs felt a bit hollow after Alexei's sharper stuff earlier. I like Marcus Brigstocke and he seems a very nice chap. However I recognise the childhood world with the local Communist Party branch having meetings in your front room and eating all your biscuits more than I recognise the traumas of being a fat boy in boarding school. Maybe by this time I'd had enough of the tipsy Edinburgh rugger types pushing into the queues or the plummy Morningside diners vacuous conversations at the table beside us for dinner ("But we're just not rich enough to pay the Gift Aid prices, are we dear?"). Time for the midnight train home to Glasgow where people either re-enacted Morocco's head-nodding drunken nap or blethered aimlessly to strangers. I have only really started in the past couple of years making the effort to head east along the M8 for the festival. Obviously it is a hugely successful enterprise for the city, but I just wish they would make it feel a bit more inclusive. I know that in recent years they have consciously targeted those living in Glasgow's G12 area for ticket sales. I just wish that they'd make a bit more effort to attract those living in G15 and G34 as well. 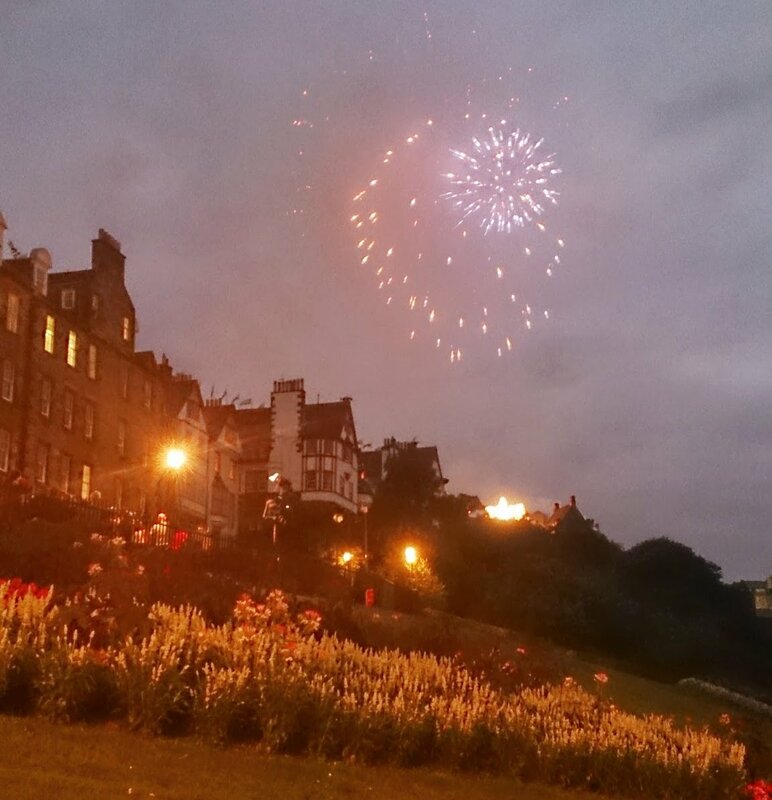 I like Edinburgh, but you can have it back now that the Fringe and Festivals are coming to an end.